Superior new home designs. Exceptional craftsmanship. Come home to picturesque front porches and wooded environments that offer the relaxation of country life with the conveniences of the big city. Distinct designs, spacious floor plans and premier amenities are part of the J. Kyle Homes experience. 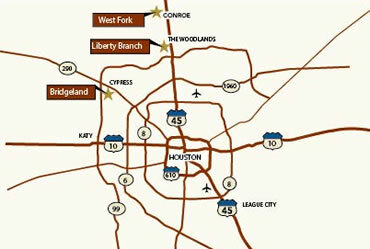 Respected Houston home builder J. Kyle Homes offers families the opportunity to enjoy resort-style living in several of the most luxurious neighborhoods in the Houston area: Lakeland Heights in Bridgeland, West Fork in Conroe, Liberty Branch at Creekside. The J. Kyle Homes commitment to excellence comes from our proud family tradition of building superior new homes in Houston communities for over 20 years. And because we're a family operation, we are dedicated to building our reputation one customer at a time. This personal attention contributes to your peace of mind and a beautiful finished product. Let our family create a new home for your family. » Click here to learn more about the care we put into your new home.